Gold rallied yesterday, right before its turning point, and reversed its course before the end of the session. Precisely, even before the US session started. Miners reversed as well, after failing to move back above the late-2016 bottom. With the critical situation in the USD Index, and gold miners’ short-term underperformance (so far this week gold is up by $8.10, while the HUI Index is down by 0.2), it appears that things will get very hot for the precious metals market shortly. Before discussing the above, let’s take a closer look at what happened yesterday and what’s happening in today’s pre-market trading in the USD Index. We already discussed the existence of the reflective pattern in the USD Index in the previous Alerts, but there’s one thing that we would like to add. Namely, we would like to address the potential (! – not completed) inverse head-and-shoulders pattern that is probably being formed. But, first things first. The remarkable thing about the reflective nature of the recent price movement is that it is so similar. The October / November 2017 top is like the August 2018 top as they both took form of head-and-shoulders tops. We marked them with red. What’s even more profound is that outside shoulders of the top above-mentioned formations (left in 2017 and right in 2018) were the inside shoulders of the inverse head-and-shoulders patterns. We marked them with green. The reflective nature of the pattern is even clearer than we thought. Now, the current inverse head-and-shoulders pattern has no direct implications yet as the price has not yet broken above its neck level, let alone confirmed such breakout. But, in light of the striking similarity between the 2017 decline and this year’s upswing, it’s likely that this formation will be completed. The completion of the local (green) inverse head-and-shoulders pattern would provide us with the target at about 98.4, which means that it would likely result in a breakout above the medium-term inverse head-and-shoulders pattern that has its own target well above 100 – at about 103. In other words, based on the above-mentioned patterns, a move to the 2017 high in the USDX appears likely. The above rally would also perfectly fit the long-term analogies in the USD Index. As you can see on the above chart, not much happened yesterday. But, in today’s pre-market trading, the USDX moved above 96.30, which means that we are seeing a breakout above the local inverse head-and-shoulders pattern – the one that points to a target of 98.4 and that is likely to lead to the completion of the bigger inverse H&S and even bigger rallies. The move above 96 materialized only a few hours ago, so it’s far from being confirmed. 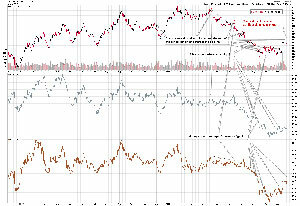 Therefore, the implications are not yet strongly bullish, but they are definitely present. 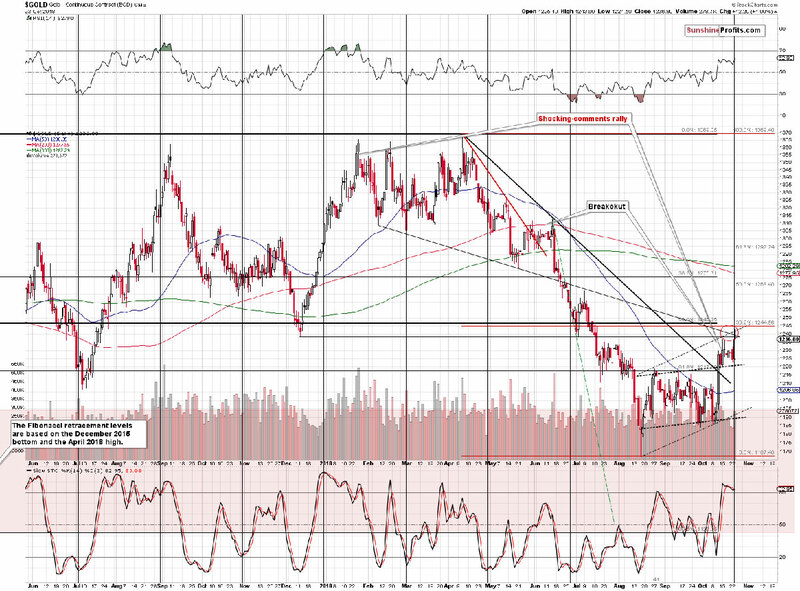 The implications for the USDX are already bullish even though they are not very strong for the short-term just yet. The opposite is the case for the precious metals sector – the PMs are likely to decline along with the rally in the USD Index. Speaking of the precious metals sector, let’s see what happened in it yesterday. Gold, silver, and mining stocks all ended yesterday’s session higher, but at the same time, they all declined on an intraday basis, during the US session. This is particularly visible in case of the GLD ETF, where we see a clearly visible black reversal candlestick (in terms of spot or futures prices, many black reversals in GLD correspond to gold shooting stars). In fact, that’s the clearest black reversal that we’ve seen in many months. There’s not one case on the above chart where the signal would be more apparent. Why should one care? Because this is what preceded the short-term declines in the entire precious metals sector in many cases. In fact, practically all short-term downswings of the April resulted in August decline. 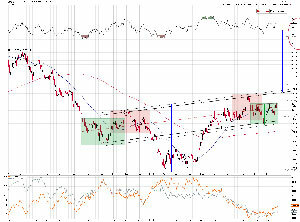 The clarity of this sell signal adds to its credibility and we can say the same thing about the corresponding short-term indications. There are two key short-term signs that we want to see before a decline. One thing is that we want to see silver outperform on a very short-term basis, and the other thing is that we want to see mining stocks underperform gold – either on a very short-term basis, or on a short-term basis. In case of medium-term moves, the underperformance could even take the form of weekly or monthly weaknesses. Silver already outperformed in early October. This relative silver performance most likely marked the true end of this consolidation and the decline should have been resumed at that time. And that would have most likely happened if the market wasn’t surprised by Trump’s comments, in which he called the Fed action regarding interest rates “crazy”. After the above happened and the entire PM sector rallied, we emphasized that the effect thereof was likely only temporary as it didn’t change anything materially – it was just a temporary news-driven upswing. Such upswings can distort the short-term technical picture for a moment but are unlikely to change anything of medium- or long-term importance. And it seems that what happened recently perfectly confirmed the above general rule. What about miners’ underperformance? It’s not apparent based on the above chart, but let’s consider 2 simple numbers. Gold is up by $8.10 this week, while the HUI Index (proxy for gold stocks) is down by 0.20. 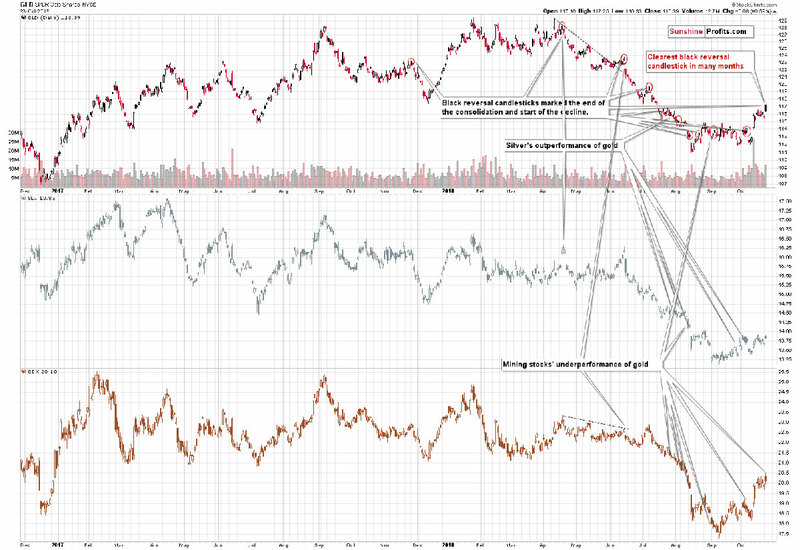 Relative gold performance is strong, but gold stocks clearly underperform, so the implications are bearish. 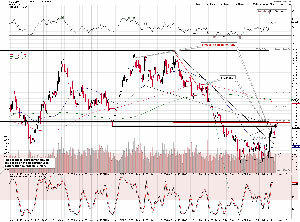 Moreover, from the broad perspective, we see that despite gold’s strength yesterday, the gold miners were unable to break back above the December 2016 low. This means that the current price pattern remains similar to what took place in 2013 before the biggest part of the decline, even though the corrective upswing was bigger in this case. Truth be told, the current rally is likely so big most likely because of the surprising “crazy comments” that we discussed above. If it wasn’t for them, the two situations would have likely been even more alike. In our previous free analysis, we wrote that gold might move a bit higher right before its reversal date (which is today – October 24th) and it seems that we have just seen exactly that. Gold touched the upper part of our target area on an intraday basis, but declined shortly thereafter. Since gold’s turning points tend to work on a near-to basis, it seems quite likely that the top is already in. If not, it’s likely to be formed this week anyway. He was supposed to be a low-interest-rate guy. It’s turned out that he’s not. Our interpretation (opinion) of the above is that since the general stock market declined, Trump wants to make sure that he’s not the one to blame by the voters and he’s pushing the blame to somebody else. The Fed is an easy target. Trump assumes that it’s better to be viewed as reckless (Powell was supposed to be a low-interest-rate guy? Come on) than to be the one that’s held responsible for the stock market decline. And he might be right from the political marketing point of view – after all, people are likely to forget about individual political decisions that don’t affect them directly but are not going to forget about the amount of capital they have on their brokerage and retirement accounts. What would this interpretation imply? Once the stock market’s correction is over, Trump will either cease commenting on the Fed’s role, or he might say that they are doing a good job after all, and that he’ll be watching them to make sure that they don’t damage the economy etc. This also means that the USD Index would soar and that PMs would take a dive as the factor that was already priced in, would cease to exist, or its importance would be minimal. 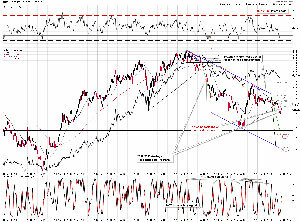 But, the above already has bullish implications for the USDX and bearish implications for gold. The trust in the US currency should be declining based on the above-mentioned comments, while gold should be soaring. But it’s not. The market seems to have already discounted this conflict in the prices and currency values. 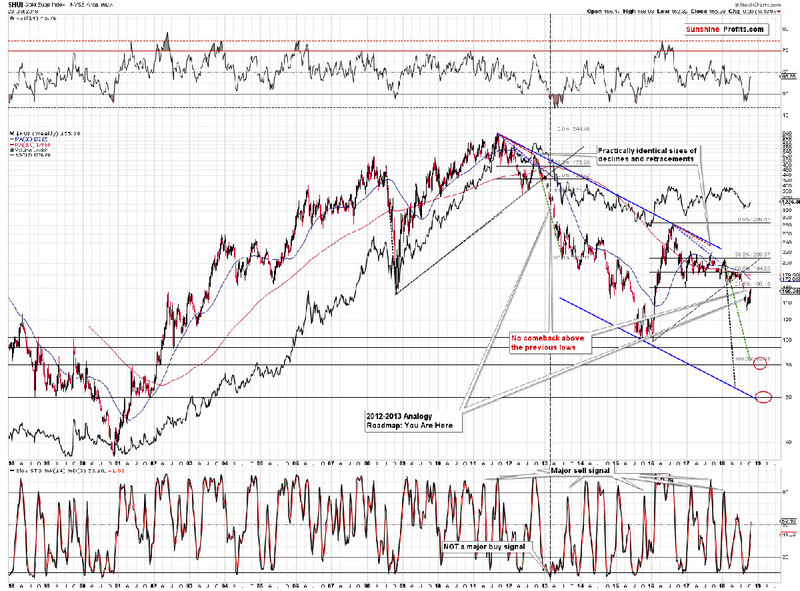 This is very bullish for the USDX and bearish for gold. Why? Because the situation really can’t get worse on this front. Trump can’t be any more straightforward with regard to his opinion on the Fed’s interest rate moves, and there’s not much more that he can do about it. And we doubt that he plans to. As discussed above, in our opinion it’s just a political theater. Fortunately, between this smoke and mirrors, we can find signals and opportunities. The fact that USDX and gold are not reacting in the way they should be reacting, tells us that these markets really want to move in the opposite way. The USDX is rallying in today’s pre-market trading. Summing up, based on yesterday’s reversal in gold (and its shape in case of the GLD ETF), mining stocks’ underperformance, and previous outperformance of silver, it seems that the local top in the precious metal sector is in or at hand. The reversal was likely to take place this week and it seems to have taken place yesterday. If not, then it’s likely to be seen this week, anyway. The very important bearish signal came from market’s reaction and lack of reaction to Trump’s new criticism of Fed’s interest rate actions. The USDX should be declining and gold should be rallying, but nothing like that is taking place, which is a very strong indication that these markets want to and are about to move in the opposite ways.